One of the things we’ve learned over the years is that getting a safety mark for products that need approval to UL lighting standards is never as straightforward as it seems. In fact, many larger manufacturers have invested millions in dedicated compliance engineering and laboratory facilities in-house to ensure the process goes smoothly for them. While it is true that the complex and ever-changing landscape of safety standards relating to lighting products can present enormous challenges to anyone trying to get to market quickly, we firmly believe the you can arm yourself with the knowledge to minimize – if not prevent – lost time and extra expense altogether. Unless you are launching hundreds of new products a year, you don’t need a dedicated staff or your own safety testing lab. Take our advice on these 5 key areas of compliance when attempting to get your products approved, certified or “listed” to UL Lighting standards, and you’ll be well on your way to saving time and money. Like the old adage, there is more than one way to skin a cat when it comes to getting your products certified to UL Lighting standards. The first thing to understand is that while Underwriters Laboratories is the organization that writes most of the accepted electrical safety standards for lighting products accepted in the US, it is NOT the only organization authorized by the US Occupational Safety and Health Administration (OSHA) to issue a certification mark. However, it is important to be aware that these organizations are much easier to deal with if you are submitting completed, production-ready, passing products. They are not your product design house! Think of them as the professor on the final day of that upper-level engineering class. They are there to grade your test – not to help you pass. You want to make sure that you are going to get 100% on the exam before you walk in the classroom. The benefit of having all of these organizations is that you are free to choose between them in order to get a listing mark. As in any competitive environment, there are differences in terms of service level and cost. Do your research carefully before committing. We say this all the time to our clients – 80% of the problems in products being evaluated to UL lighting safety standards are discovered before testing even begins. When a product is submitted, the first thing a compliance engineer will do is evaluate its construction. The biggest issue here is that the current-carrying, or “live” parts of the product should always be made out of a corrosion-resistant metal or alloy such as silver, cooper, plated iron or steel, or stainless steel. Making sure that un-insulated live parts are well secured. Friction alone between surfaces is not an acceptable means to prevent that part from turning or shifting! Enclosures, or the material used to encase a product, are usually metal or polymeric (i.e. : plastic), or a combination of both. Generally the most complicated and safety critical part of a lighting product, there are many areas to investigate when it comes to making sure your compliance bases are covered. With any enclosure type, the safety concern has to do with how it will react to electricity and heat. Metal enclosures need be measured for thickness, and supplied with adequate corrosion protection and grounding. Metal materials also need a specific spacing of at least ½ inch to “live” parts of the product. Plastics must be tested for how they react to heat, and need to carry a minimum rating of V-2 (according to UL 94) for portable, unattended duty products, and 5V for permanently connect products. While most people who work with plastics in product design understand flame rating requirements, they often do not realize that the plastic material must meet the required thickness for its rating: i.e. It’s not enough simply to use an appropriately rated plastic for your enclosure without ensuring that the thickness is correct. The best approach is to always use a UL recognized polymeric material. In UL Lighting standards, as in may other electrical safety standards, the terms “creepage”, “clearances”, and “spacings” often intermingle. 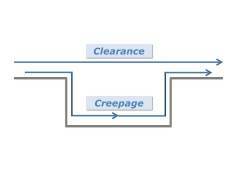 Creepage refers to the distance over a surface. This becomes a very important factor when considering the conductive properties of the materials on a printed wiring board (PWB). Clearance is the distance through the air between components and often between the components and the enclosure or other parts of the product. Spacing is a term in UL lighting standards used to describe both of these. Generally all three refer to requirements for certain distances between “live” parts and user accessible”dead” metal, and live parts of opposite polarity. The implication of spacings that are inappropriate for the components and/or material type used is the risk of fire or shock. Therefore, appropriate spacings will very much depend on which components and material you choose. Refer to the specific standard you are working with and pay close attention to spacing requirements wherever they are noted! Another one of the questions I hear from clients almost every day is the following: “All of my components are UL, so I should have no problems getting a mark on my product, right?” My answer is usually a variation of: “I wish it were that easy! Wouldn’t that be nice?” Actually this is only the starting point. Of course, while it is true the use of any non-UL components – especially ones that are considered safety critical – is going to make the process of testing the end-product more complicated, it is not at all a safe assumption to assume that making sure that all your components are UL will let you sail through and pass with flying colors. The reason for this has to do with a common sense approach to component evaluation termed “Conditions of Acceptability”, or C of A. When thinking about how your components affect your chances for compliance success or failure, you must think about “acceptability”. For example, the C of A for a switch is its voltage and current rating. You may be using a UL switch, but if it’s rated 3 Amp and you’re using it in a 5 Amp circuit, it’s not acceptable. Understand the ratings and acceptable uses for all components! Ask the component manufacturer for their C of A’s (contained in the first part of their UL file), and make sure you are using the component within the rating specified.